For the small or individual basket: Chain 9, join to form a ring. 1. Chain 3, 19 trebles in ring, join to top of 3 chain. 2. Chain 3, a treble in same place, * 1 treble in next stitch, 2 in next; repeat from *, making 30 trebles in all, and join to top of 3 chain which represents 1st treble. 3. Shell of 8 trebles in a sitch, (chain 3 for 1st treble), miss 4; repeat, making 6 shells in all, and joining last treble of 6th shell to 1st of 1st shell. 4. Chain 4, fasten in 2nd treble; repeat around shell, fastening last loop between shells, and continue around each shell, fastening last chain where 1st started. This completes the bottom of basket. 5. Either break thread and fasten in , or slip down side of shell to top of 2nd row, then work 1 double in back loop of each treble all around, join. 6. Four trebles in 4 doubles(always chain 3 for 1st treble of the row), chain 3, miss 2; repeat around, joining last chain to 1st treble (or top of 3 chain which represents 1st treble). 7. A double in each troble, chain 5; repeat around, join. 8. A double in 2nd and 3rd of 4 doubles (to start the row slip over 1st double), chain 3, 4 trebles under 5 chain, chain 3; repeat around, join. 9. Same as 7th row. 10. With color (pink was used for the modle, but blue, violet, green or other color may be chosen to harmonize with the china-decoration, or thebaskets may be entirely of white) make a treble in each or 2 stitches, 2 in next; repeat. 11. Shell of 2 trebles, 2 chain and 2 trebles in a stitch, miss 3, repeat around, join. 12. Chain 3, a treble in each stitch all around, join. 13. Same as 6th row, putting 4 trebles in 4 trebles, and so on. 14. Same as 7th row, with 7 cahin between groups of doubles instead of 5 chain. 15. Shell of 4 trebles, with 1 chain between, in a stitch, miss ; repeat around, join. 16. Same as 4th row. Fasten off neatly. 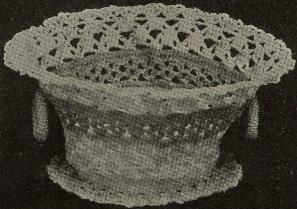 A half dozen of the individual baskets may be made, or eight or a dozen, as one wishes, or as may be required. If the top is wanted less flairing make the 14th exactly like the 7th row. For the large basket: Chain 9, join. 1,2. Same as 1st and send row of samll basket. 3. Two trebles in a stitch, 1 in each of 2 stitches; repeat, join. 4. Tow trebles in a stitch, 1 in each of 3 stitches; repeat, join. 5,6,7. Same as 4th row, with 1 more treble between widenings, each row; or widen as required to keep the work perfectly flat and smooth. 8. Same as 11th row or small basket. There are 23 shells in the row, and 3 or 4 stitches may be missed between, as required; join last shell to 1st. 9. Slip to center of shell, and make a shell as in 15th row of small basket in each shell of last row; join. 10. 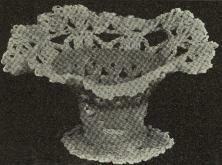 Same as 4th row of small basket; fasten off neatly, completing bottom of basket. 11. Fasten in at top of last row (7th row) of trebles, in which 1st row of shells of the bottom was worked, and make a treble in each treble, all around; join. 12. A double in each of 4 trebles, chain 5, miss 4; repeat around, join. 13. Same as 8th row of small basket. 14. Same as 7th row of small basket. 15, 17, 19. Same as 13th row. 16, 18. Same as 14th row. 20. With color, a treble in each stitch (working in back loop) all around; join. 21. Same as 11th row of small basket, missing 4 between shells; join. 22. Slip to center of shell, and repeat 21st row, making shell in shell; join. 23. Same as 20th row. 24. Same as 12th row. 25, 27. Same as 13th row. 26, 28. Same as 14th row. 29, 30. Same as 15th and 16th rows of small basket. For the rings or handles: Chain 7, join. A double in each stitch of chain, then double in double, working around and around until the trip is three inches long; finish off neatly, sew togeter with needle and thread, and attach to basket a top of 23rd row (color); make another handle and fasten to the oopposite side. Stiffen the baskets by dippin in a solution of sugar and water, in melted parraffine or starch, shapin them nicely as they dry. The large basket may be used for thread, buttons, or any sort of trinkets, and may be increased in size until you have a workbasket. No. 10 thread was used for the models, but coarser or finer may be substituted at pleasure.